Yo Y21 Review - An Alternative to the Go Pro HD Hero Range? Edit 2018. This Yo Y21 review is somewhat dated now but I am leaving it up for referenced, archived and historical interest. Having used the Go Pro HD Hero and HD Hero 2 for the past year, I was more than intrigued when a copy of the new Yo! Y21 was recently sent to me to review. Note: In the interests of anyone looking to buy a POV camera, it is only fair that I compare this camera to what I consider to be its closest rival. The Go Pro HD Hero 2. The HD Hero 3 is way more expensive and IMO is a league ahead of anything currently on the market. I first used a POV camera, the Contour HD 720p, during my moto-x ride through Africa in 2009 and I was hooked. Being able to get "up close and personal" footage of any cool things that you get up to is a great buzz. It gives a great perspective to any sporting activity. The casing is larger on the Y21 as it comes with the LCD BacPac already attached which is great as you have to buy it separately with the Go Pro. The lens is more central on the Y21. This means the LCD menu on the main camera, which incidentally is very small, has been put on the top of the camera. When the LCD screen is attached, obviously you would use that to navigate the menu. Now, in the video above, I do mention a gripe. You need to remove the camera from its housing, or use the remote, to turn it on and off which would be a pain when using the housing. However, I since noticed that you can leave the camera switched on and it will "go to sleep" after a while. It is easily re-activated by simply pressing any of the buttons. Phew. One big addition which beats its counterpart, is that the Y21 has a standard tripod thread on the base. This is on both the actual camera and the waterproof housing. That means it will attach to a tripod, Gorillapod etc with or without the housing or extra accessory attachment (like the Go Pro £8.99). From what I have seen so far, all the mounting options are virtually identical to the Go Pro mounts. Therefore, if you have the suction cup from the Go Pro Motorsports version for example, you can use this as I did in the video. Good thinking by the Yo! Y21 here as long as it doesn’t tread on any copyright toes. Probably the biggest plus over the Go Pro is the fact that the underwater housing on the Y21 includes a flat port for the lens as standard! This means it will produce sharp images and footage "out of the box" unlike the Go Pro HD Hero 1 & 2. For those, you will need to shell out a whopping £49.99 for the privilege of sharp, underwater imaging. Note: The Hero 3 has a flat port lens housing...about time Go Pro). Like the Go Pro, the Y21 has a mini HDMI and USB out to connect to a TV or computer. They both also have audio in which is a good feature for vlogging or generally better sound. AV out is also there although both of these on the Y21 are from the same port. Whereas the Go Pro HD Hero 2 uses standard SD cards, the Y21 takes the smaller micro SD cards. This is the same as the new Go Pro HD Hero 3. These tiny cards currently (as at 2012) come in a range of sizes up to 64gb so plenty of space that will last way longer than a single battery. Make sure you get a quality card of Class 10 or higher that can handle and buffer HD video for long periods.. The first item in the menu allows you to switch from video to audio only. Good for memo taking I guess? I found this very useful on the Contour HD when the camera was attached to my crash helmet. I could align the video (using 2 lasers on the Contour) prior to shooting. It does seem that the laser stays on with the Y21. I ended up with a red dot in the centre of the frame that resembled a dead/hot pixel. I expect you can turn it off during filming but I have yet to work it out. In all honesty, when out and about, you probably wouldn’t see it. This allows you to start recording after a 5, 10 or 20 second delay. Good feature that allows you to start the camera and then get your gloves on prior to recording...saves memory. So there you have it, or most of it anyway. All in all, this camera and supplied accessories, pack a punch right out of the box with plenty of features to keep you going. The video footage for me was a little saturated and some highlights were blown in comparison to the Go Pro. However, overall it's not bad at all and most definitely usable. Edit: I have already had someone state that they prefer the more saturated colours of the Y21 since writing this. I guess it is horses for courses on that front. As an alternative to the more pricey Go Pro, I would say it was definitely worth a look. It all depends on your budget and what you are looking for in a camera. More features features and bang for your buck or slightly higher quality footage? For me personally, I like the camera. I think it is a great little POV camera that can also be used as an everyday camera right out of the box. It is also great as something to have in your pocket "just in case". So, like for like, the Yo! 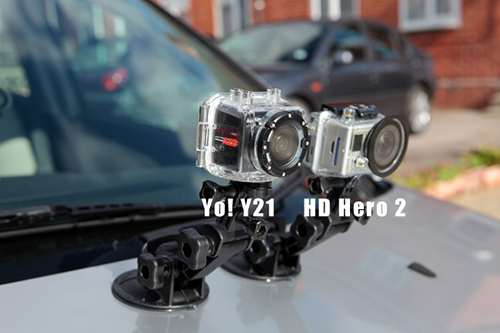 Y21 represents excellent value over the Go Pro HD Hero 2 saving around £180.